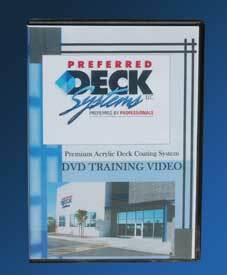 This one-hour DVD covers all of the basics of the Preferred Deck System. This video shows the entire application process on actual job sites and demonstrates the use of all Preferred Deck products. This DVD focuses on all Steps 1-5, as well as all of the main Texture Coats (Lace, Flagstone, Saltillo, Granite, and Stamped Overlay.) It is divided into chapters for easy viewing and review.